Outdoor playtime is a vital part of children's physical and mental development, which is why it's important to select the right playground equipment for your playground. The equipment installed on your playground should encourage kids to be physically active and should include accessible options for children with special needs. 1. Get educated on how the ADA (Americans with Disabilities Act) and licensing requirements will impact your playground. The ADA has specific guidelines for accessibility that your playground and playground equipment must meet. One requirement mandates that any pathways in your playground must connect the play area to the parking lot. Rules and regulations and other licensing requirements in your state, community, and school will also play a role in the equipment you need for your playground. Be sure to educate yourself on all of these factors to ensure that your playground and playground equipment are in compliance and are accessible to children of all abilities. The U.S. Consumer Product Safety Commission has a great playground safety handbook you can peruse for a variety of safety information and requirements. 2. Perform a playground audit and needs assessment. The size of the play space and the overall playground layout. The number of children who will be using the playground at one time. The ages of the children who will be using the playground and its equipment. Any special needs or disabilities that should be considered when selecting equipment. 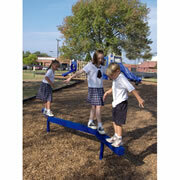 A playground consultant can suggest other factors you should consider. He or she can perform a full audit on your playground space if you would rather have a professional assess your playground. 3. Evaluate your existing equipment. Evaluating your existing equipment can help you determine what needs to be replaced and what type of equipment you'll be researching and selecting. Make sure all of the existing equipment meets CPSC/ASTM and ADA guidelines. Take note of how popular the existing equipment is with the children in your care - this can help you decide if the equipment needs to be replaced with something similar or if you need to look at other options for the play space. 4. Determine your budget for the project. Keep in mind that the actual equipment is only part of your budget equation. Depending on the condition of your playground space and the types of additional services needed, site preparation, freight charges, storage fees, new surfacing costs, and professional installation may be other associated costs you will need to factor into your budget. If you don't have a large enough budget available for your playground project, consider completing the project in phases. This enables you to work with a smaller budget without losing quality and value. Donations from the community, parents, and volunteers often provide valuable assistance. Fundraisers are often a great way to gain community support and raise enough money to complete your project goals. Grants and financing options may also be available. 5. 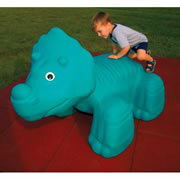 Research and select your playground equipment. Once you have assessed your playground space, evaluated your equipment, worked out a budget, and decided on the type of equipment you're looking for, you can start researching playground equipment and playground providers. 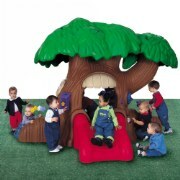 Check websites, read customer reviews, and ask if any free literature is available on playground equipment selections. Many playground structures come in a variety of colors, textures, and materials, so decide if you want to make a bold, colorful statement or if you want playground equipment that blends in with the environment. Whether you're looking for a pre-designed structure or need a custom design, you should be able to find a variety of playground equipment that's just right for your play space. You should also consider site amenities and surfacing materials as you're selecting equipment. 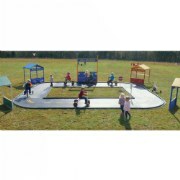 Look at the existing surfacing to see if it needs to be replaced or replenished, and pick site amenities that make a great selection of equipment even more fun and safe for kids. Make sure you properly prepare the site for delivery and installation once you've selected and ordered your playground equipment, site amenities, and surfacing materials. Playgrounds are an integral part of preschool and elementary classrooms, so taking the time to select the right playground equipment for the kids in your school can only improve upon the outdoor play experience. Browse our playground resources and playground equipment for more information about designing your playground and picking out appropriate playground equipment. You can also contact us and ask to speak with someone in our playground department if you have questions or would like some additional assistance in selecting playground equipment and meeting ADA and licensing requirements.